The Char-Broil Charcoal Gas Hybrid was 14 years in the making. And, it wasn’t a quiet 14 years. Nope, it was a loud and very much publicized manufacturing stage with a great backstory. Ok, so rewind back to 2003. Char-Broil having been obsessed with the idea of under-cutting the competition by creating a Gas and Charcoal Grill for under 200 Dollars, painstakingly worked on their design. In 2004 they released it. 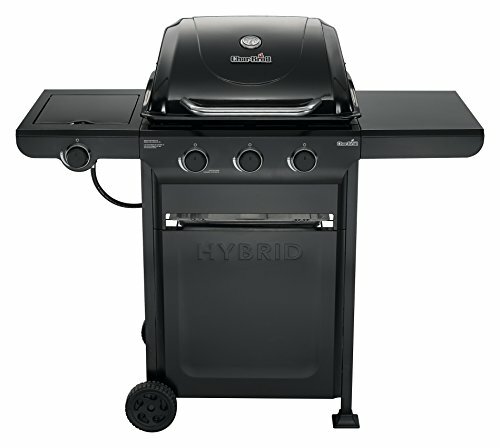 Its name was the Easy Charcoal Gas Hybrid Grill. It worked by working as a normal Gas Grill, and then when you wanted to use Charcoal you lit the Coals up with the Burners. Now, most of these hybrids cost well in excess of 500 bucks so success here at under 200 meant riches. Unfortunately, it was terrible, it was taken off the market quickly and became one of the worst Grills in company history….. Years later they persuaded themselves to take another look at the idea. The result was this Grill with the same name except they’ve taken off the ‘easy’ part. You can find out here whether they got it right this time. Now bear in mind it costs around 290 Dollars so about half the price you’d usually pay for a Hybrid. This is pretty darn good looking Grill. Well made and looks like it’s worth much more than it is. You get a Side Shelf on the right side and the whole cooking surface is placed on top of a large storage cabinet. The Sheet Metal build can get quite hot if you’re cooking for a long time so watch your hands when you touch it. And the sides are prone to slight rusting so make sure you get a cover. It’s one of those things. They had to cut costs to get the price down to below 300 and they did it by using Sheet Metal. It is durable though. There’s a very easy assembly here given that it almost comes ready to go straight out of the box. It’s a case of just screwing the cooking top onto the Cart and then screwing the Lid onto the cooking top. Easy 30-minute job. You get 370 Square Inches of space and a total of 545 Square Inches of space when you count the Side Burner, Shelf and Warming Rack. That’s enough easily for a whole family and it’s one of the largest cooking areas available under 300. So the first touchdown to Char-Broil. You get 3 10,000BTU Burners and Cast Iron Grates. The Burners are very slow to put heat out and you’d question whether they actually are 10,000BTU. So despite the terrific Grates, you’re going to have to wait before there’s enough heat to start cooking. Once the heat is up to what you need, it disperses slowly. The food cooked on this does taste nice and has lots of flavors, but it just takes its time. Then again the price is one-third of the usual combi price so I can’t go overboard with the time critique. Very easy to clean. The entire surface is Porcelain coated so a bit of water and a Rag will do the job. The same as on Char-Broils previous attempt. When you want to cook with Charcoal you take off the Grates and put in the Charcoal Pan (it comes with the unit). You then fill it with Charcoal and light the Coals using the Burners before putting the Grates back on. Unfortunately, it takes a full 15 minutes to get this lit. The problem comes from the Pan holding the Charcoal being made out of Steel. You have to wait until enough heat from the Burners gets into the Charcoal and causes them to light. Don’t pay attention to the instructions. They tell you to use 2 pounds of Charcoal. But this amount will not cover the entire Pan. You need at least 3 pounds. As with the Gas Grill, the Charcoal Grill creates very nice tasting food with excellent texture and moisture. Are you prepared to wait for these nice results?. The Side Burner here is excellent. You get 12000BTU’s of heat and it gets to cooking temperatures incredibly quickly. There’s Cast Iron Grates here like on the primary cooking surface, but here you get much more power relative to space, so it’s not just a Side Burner; it’s also something you can use to Sear meats and Fish. There’s no problem with the quality of the food you can cook on this. That goes for both the Charcoal and the Gas Grill. The Grates are also very good as is the Side Burner so it’s a major improvement on the 2004 model. But it takes a longer time to cook food compared to other combi’s. You also have to take into account the much cheaper price you’re paying here for a combi. But if you have a lot of people to cook for and not much time then you’ll want to give it a miss. Thank you for reading.